South African Rooibos herbal tea with mandarin orange flavor. It is an exotic twist on your favorite beverage. Easy to make into your favorite iced tea. On cold, gray days like this one, sunny tasting tisanes like this really make the day a little brighter. This blend really lets the sun shine in! 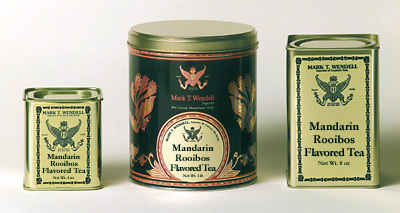 The fresh, juicy flavor of mandarin oranges really goes well with the natural wood and nut flavor of rooibos. The mandarin essence does not mask the natural flavors of the rooibos, it doesn’t need to! That’s because somehow the natural flavor of the mandarin melds so well with the taste of the rooibos, creating a profile that is smooth, light and delicious. This is a very refreshing blend. I find this to be most inviting when it is iced, but it is also good hot. It has a natural sweetness to it, so it doesn’t need additional sweetening, but I find it to be very agreeable with a small drizzle of raw honey. I like the way the honey highlights the mandarin flavor.